The Bull Shark (Carcharhinus leucas) is a large coastal shark reaching 11 feet in length that is very comfortable in shallow estuaries. This species is well-known for its ability to tolerate low-salinity and even fresh water. As adults, Bull Sharks are apex predators capable of consuming prey as large as Bottlenose Dolphins, and act as apex predators in nearshore and estuarine environments (and even some freshwater ecosystems). Adult Bull Sharks travel widely and may range as far up the U.S. east coast as New Jersey and are seen regularly in Chesapeake Bay and the sounds of North Carolina. The juveniles, however, are much pickier about their habitat and spend most of their formative years in the brackish parts of warm estuaries. Bull Shark nurseries are known in areas of the Gulf of Mexico like Mobile Bay, Alabama and Charlotte Harbor, Florida. On the U.S. east coast, the northernmost Bull Shark nursery was thought to be the upper portions of the Indian River Lagoon in Florida. Was. My co-authors and I were not specifically looking for Bull Sharks when we started analyzing coastal shark catch data from the North Carolina Division of Marine Fisheries (NCDMF) fishery-independent gillnet survey in the Pamlico Sound as part of an effort to characterize shark habitat in the state’s estuaries. In fact, previous evidence would have convinced us that Bull Sharks would likely be rare. A study by Dr. Frank Schwartz at the University of North Carolina Institute of Marine Science compiled data on Bull Shark encounters from a wide variety of sources covering a time period from 1965 through 2011, and reliably documented only nine juveniles over the entire time frame. We looked at NCDMF gillnet survey data covering the years from 2003 through 2016. In that time, the survey captured 70 Bull Sharks, all within the juvenile size range for the species. All but six of those sharks were captured since 2011. Catch per unit effort (CPUE, measured in mean number of sharks per gillnet set) each year of the NCDMF gillnet survey in Pamlico Sound. Note the big spike in shark catch in 2012 followed by a consistent steady increase after. From Bangley and friends (2018). The catch data (shown as catch-per-unit effort, or CPUE, measured as sharks per gillnet set) show a remarkable transition from Bull Sharks only appearing as very occasional strays to becoming a regular presence in the survey following a huge spike in captures in 2012. Also, the size range of the sharks has been expanding: where 2011-2014 most of the sharks have been within the size range that should fall within their first one or two years of life, in more recent survey years larger juveniles, some pushing 5 feet in length, have been showing up. The sharks start showing up for the year in late May and early June, which coincides with the timing of birth in the Indian River Lagoon, and it makes little sense that these sharks would be born in Florida and rush all the way up the coast to North Carolina within a matter of weeks. The presence of juveniles in their first year of life, or young-of-year, suggests that new sharks are being born in Pamlico Sound. The presence of larger juveniles is one piece of evidence that they might be coming back repeatedly. Obviously, something had changed in Pamlico Sound to make it suddenly hospitable for a population of juvenile Bull Sharks. To find out what that might be, we used the environmental data recorded by the NCDMF survey crews, which included depth, water temperature, salinity, and dissolved oxygen. We also added some spatial variables in the form of distance from the nearest inlet (the only openings to the ocean in the estuary) and distance from the nearest submerged aquatic vegetation (SAV) bed (North Carolina has excellent maps of SAV habitat available thanks to the efforts of the Albemarle-Pamlico National Estuarine Partnership). We fed these variables, along with Bull Shark catch data into a generalized linear model with a negative-binomial distribution to account for the high number of sets in which no sharks were caught (because an important part of identifying shark habitat is also knowing where they aren’t). The purpose of this model was to identify which environmental variables had a truly significant relationship with Bull Shark CPUE (as opposed to an association by random chance). Pamlico Sound is a huge area, and to make sure model results were consistent across the sound we ran two models; one covering the entire estuary and another covering just the area of the sound where Bull Sharks were actually caught. Ultimately the model showed that Bull Shark CPUE had a significant relationship with temperature and salinity, specifically that increases in these variables correlated with increases in shark catches. Sure enough, the environmental data recorded by NCDMF showed an increasing trend in both of these variables, especially temperature during the first half of the summer when Bull Sharks are born in other nurseries. Three ways of looking at associations between actual Bull Shark catch (dark red dots and line), Bull Shark catch predicted based on environmental measurements (lighter red triangles and line), and environmental measurements recorded by NCDMF (blue diamonds): (a) water temperature, (b) salinity, and (c) percentage of days in which water temperature was over 22 °C, the minimum temperature at which Bull Sharks were caught. Model results predicted a steady rise in Bull Shark catch, but actual catches spiked up in 2012. From Bangley and friends (2018). To verify this relationship independently, we took temperature and salinity data from the NCDMF trawl survey in Pamlico Sound, which takes measurements using similar methods to the gillnet survey but has never caught any Bull Sharks (because active sharks like Bull Sharks are usually able to get out of the way of bottom trawl gear). The trawl survey also has environmental data going back to 1971, giving us a much longer time series to observe environmental changes. 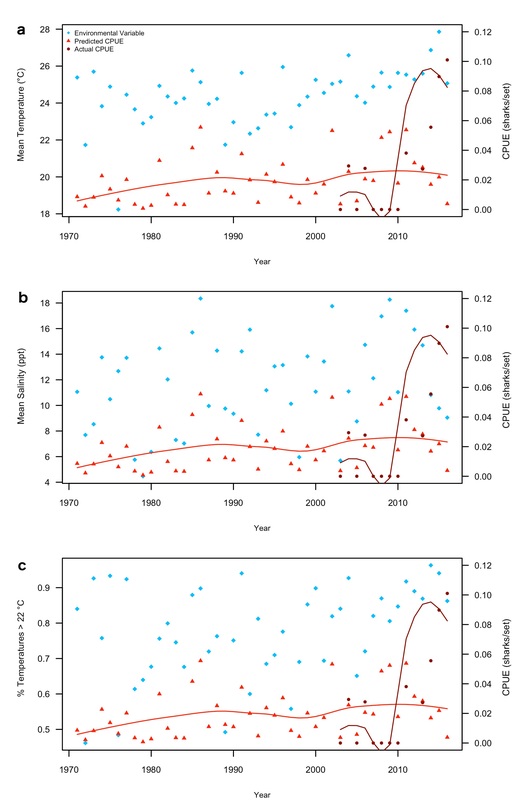 Temperature and salinity also showed increasing trends in this survey, and our model predicted that Bull Shark CPUE (should the trawl be as capable of catching sharks as the gillnet) would gradually increase along with these environmental variables. Interestingly, the model based on trawl survey data did not predict the same kind of sudden increase seen during 2012 in the gillnet survey, but it did confirm the positive association between higher Bull Shark catches and increasing temperatures and salinity. So what did we learn from all this? The biggest take-home is that since 2012 Bull Sharks seem to have taken a liking to Pamlico Sound as a nursery habitat. Whatever conditions Bull Sharks prefer for choosing a nursery must have crossed a threshold where they’re just right for mother sharks to drop their pups off in North Carolina instead of Florida. The repeated presence every year since suggests that the presence of juvenile Bull Sharks in the estuary is likely to be the new normal going forward. And this change is likely associated with the fact that the sound is getting warmer and saltier. While other marine species have been proven to be shifting their range in response to changing ocean temperatures, to our knowledge this is the first study to link a local increase in shark numbers with a changing environment. In typical scientific fashion, this conclusion only leads to more questions, some of which we’re getting geared up to try and answer. First, where are these sharks coming from? Are they migrants from Florida waters or a previously-unobserved population unique to North Carolina? We’ve been collecting fin clips from Pamlico Sound Bull Sharks and are in the process of seeing how they relate to other nearby populations (project supported by North Carolina Sea Grant). Another question concerns where these baby sharks go during the winter. Pamlico Sound may be as warm as the Indian River Lagoon during the summer, but it gets considerably colder in the winter and juvenile sharks are only caught from May to October in NCDMF surveys. Where are they going when it gets chilly? Glad you asked, because we’re tagging juvenile sharks in the estuary with acoustic transmitters (as part of the Smithsonian Movement of Life Initiative) and the data should tell us where they go to get away from the cold and whether they’ll come back the next year. Finally, even the juvenile sharks are likely high-level predators in the estuary. What are they eating and what effect might they have on the other species in the area? If you know anything about my research career, you know I’ve already got plans to look at their diet. Bull Sharks are far from the only species on the move thanks to a changing climate, they’re just a particularly large and charismatic one. Even if we’re able to halt climate change in its tracks, clearly some of the range shifts predicted by researchers are already under way. Moving forward, it will be important to continue monitoring the changes in ecosystems and studying why they’ve happened and how both species on the move and species staying put will be interacting with their new neighbors. From lead author Dr. Charles Bangley, Postdoctoral Researcher at the Smithsonian Environmental Research Center. Are the former Bull shark nursery sites losing population or is the Bull Shark population expanding because of the warming? Great question. 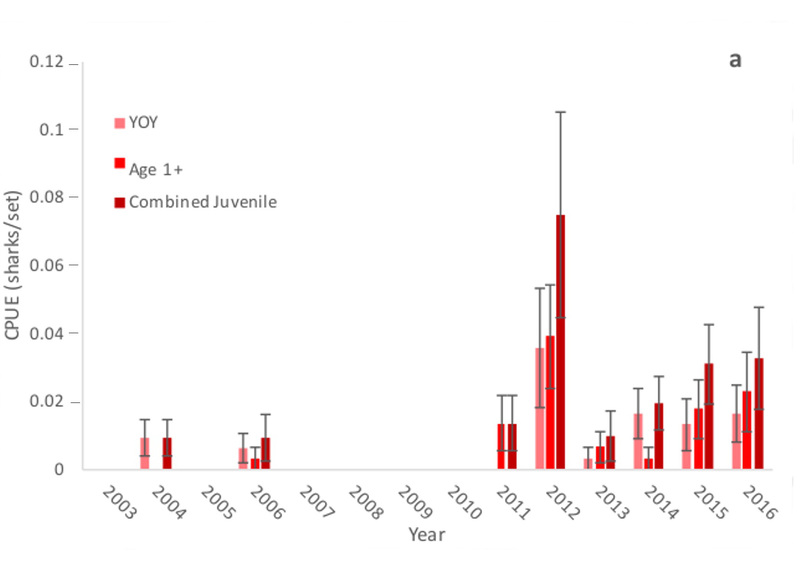 To my knowledge there hasn’t been any evidence of declining juvenile numbers in already-known Bull Shark nurseries, at least those in US waters. So far this appears to be an expansion, but there’s a possibility that other nurseries to the south may be abandoned in the future if local temperatures get too hot. Is there any connection between their food source or hurricane events that effected the Sound and their new use Pamlico Sound? Also, are there other potential nursery habitats north from Pamlico you would predict they might further expand into? Bull Sharks do respond to pulses of food from freshwater sources, things like fish migrating out of rivers. That’s likely one reason you see the area of highest Bull Shark catches in Pamlico Sound near the mouth of the Pamlico River. So they may gather near freshwater sources after a big rainstorm to grab animals that get pushed out of the river. On the other hand, juvenile sharks have been documented leaving estuaries just before a hurricane hits so they would likely temporarily leave the sound if a really big storm was passing through. As far as where they might go next, it’s hard to say but Chesapeake Bay would be my guess. It’s a big estuary (the largest in the U.S.), just north of Pamlico Sound, and adult Bull Sharks are spotted within it on a fairly regular basis. There are a lot of places in the bay where juvenile sharks could find the brackish salinity and shallow water they seem to like in Pamlico Sound.